On the occasion on World Teachers' Day 2018 on 5 October, UNESCO has published a concept note to highlight that the right to education is not just about access to education but also includes quality education, which requires qualified teachers. World Teachers’ Day 2018 marks the 70th anniversary of the Universal Declaration of Human Rights (1948) that recognises education as a key fundamental right and establishes an entitlement to free and compulsory primary education, ensuring inclusive and equitable access for all children. This year’s theme, The right to education means the right to a qualified teacher, has been chosen to remind the global community that the right to education cannot be achieved without the right to trained and qualified teachers. Even today, a continuing challenge worldwide is the shortage of teachers. There are an estimated 264 million children and youth still out of school globally. To reach the 2030 Education Goals of universal primary and secondary education, the world needs to recruit almost 69 million new teachers. This ‘teacher gap’ is more pronounced amongst vulnerable populations, such as girls, children with disabilities, refugee and migrant children, or poor children living in rural or remote areas. World Teachers’ Day 2018 spotlight is teaching in crisis and emergency contexts. As the concept note says, and according to the United Nations High Commissioner for Refugees (UNHCR), 65.3 million people, of which 21.3 million are under 18 years of age, were forced into leaving their homes due to limited employment opportunities, ethnic or religious persecutions, armed conflict or violence, political crises, or natural disasters. 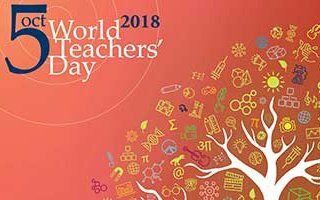 The UNESCO's concept note on World Tearcher's Day 2018 is available, here. For more info on quality education, please visit our thematic page. For more info on education in emergencies, please visit our thematic page.